The powerful set has overhead cogs, ominously grinding continuously as if to echo the drudgery of life in factories and mills around the Victorian and early 20th century eras. The backdrop could almost be a painting by Turner or Goya but with various lightings, creates several stirring moods and whilst the overall set is American enough, the tall brick pillars of the mill gates could easily be those of an English â€˜dark, satanic millâ€™. This is an All-American story which strongly resonates with English industrial history, right down to the greedy, heartless mill owner and the use of the military to quell workers' protests. And this is not about racial divides; blacks and whites amidst a host of different nationalities are united as the downtrodden. There are some differences to English workersâ€™ struggles worthy of closer examination. This is not about the birth of a political movement akin to a socialist workers party and the workers here essentially just want fair treatment rather than having a Marxist-inspired political agenda. Also, whilst the Salvation Army is closely involved, it seems very unconvincing when one Salvationist eventually openly denounces God because of the workers' sufferings. As recently as Martin Luther King in the 1960â€™s, Christian leaders have been very closely linked to fighting oppression in America and the Salvation Army has a reputation for sticking it out through the thick of things. King himself was well aware of the potential cost; his famous â€˜I have a dream speechâ€™ notably contains the words â€˜I may not get there with youâ€™. 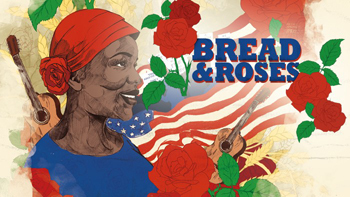 Bread and Roses is a lot more than a Dickensian-style tale of American social inequality; the play moves along at a steady pace, there are some nicely observed romantic moments and snippets of American life, such as a man teaching a woman to hold a fishing rod by a river which conjure up images of Mark Twain stories and the effect of a community is convincingly brought over.Â The musical interludes are frequent and varied, including some great bluesy numbers (although the guitar does appear suspiciously modern in style). The characters are engaging. William Dukes, the villain of the piece, admirably played by Matthew Ganley, would probably be running a budget airline or a gig economy conglomerate if he were around today. Claire Burns as Anna LoPizzo gives a feisty performance as one of the leading workers, whilst Rupert Hill is very charismatic as fellow protester Joe Ettor. Tule Dorgu, Lauryn Redding, Emma Naomi and Sophie Mercell all portray memorably sensitive characters and Oliver Wellington excels as the horridly compromised Cal Jackson. This is a big production with a cast and chorus in excess of twenty. The show has a convincing and satisfying conclusion but is spoilt a little by one of the main characters appearing in modern dress and giving a speech which with wide ranging aspirations would not be out of place at a Labour Party Conference, but seemed a little too all-encompassing to remain fully within the context of the play. Overall, writer Ian Kershaw has put together a very full and entertaining play which brings forth a largely forgotten piece of history that remains relevant to todayâ€™s world; in the USA, the UK and further afield. Bread and Roses is on until 7th July.